TEAM Brite claimed their third RTTC championship of the season in Norfolk on Sunday when Jonny Clay, Rob Hayles, Matt Illingworth and Chris Newton destroyed the opposition in the National 100-kilometre Team Time Trial at Gayton, near King's Lynn. It was poetry in motion as the well-drilled Brite quartet stormed home in 2-02-35 to put them 5-14 clear of the Team Ambrosia squad of Ian Gilkes, Kevin Dawson, Mark Lovatt and James Notley. 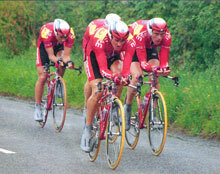 Team Clean repeated their bronze medal performance of 1997, but their foursome of Sean Yates, Richard Prebble, David Akam and Tim Stevens were a further 2-03 down on Ambrosia. All three teams suffered from punctures, but while Team Brite escaped with just one - in the closing kilometres - both Ambrosia and Team Clean were bedevilled with trouble as overnight rain washed grit onto the country roads. Tim Stevens lost contact with his Team Clean colleagues following a flat early in the race, and then Akam too punctured - and suffered an attack of cramp at the same time - during the second of the event's two 50-kilometre laps. Ambrosia certainly didn't have the gods on their side, either. Gilkes was their first victim, then Dawson had the first of his two punctures and Notley too, was brought to a halt. Team Brite `B' also suffered four punctures. Colin Sturgess collected two, while John Tanner and Chris Walker managed one each. Only Bryan Steel avoided that sinking feeling, so the team did well to take fourth with 2-10-29, leaving the team vehicle, like many others, bereft of spare wheels. Halifax Road Club and both the MCS RT teams failed to finish the distance because of punctures and other trouble. After making the running in the Premier Calendar road series, Team Brite underlined their all-round talent as they made it a hat-trick of time trial wins after Rob Hayles' individual titles at 10 and 25 miles. The BS29 used for this East District CA promotion was far from the usual dual-carriageway courses, with a mixture of A and B roads which were virtually traffic-free, but with numerous twists and turns. From the start near Gayton, the course headed east to Litcham and then north to Fakenham before a 20-kilometre head wind stretch along the A148 to Hillington, where a left turn took the riders back to the start and a second lap. It was raining as the early starters went off, and although the rain stopped as the wind picked up, the roads were still damp. The 50-kilometre times began to appear and hard-luck stories soon filtered back as some teams returned for an early bath. CC Breckland lost their main hope, junior 25-mile champion Bruce Sandford, with a puncture. Halifax RC lost Martin Ingham, and then a puncture brought them to a stop. The early standard was set by Team Ambrosia with a 1-03-54 first lap. They had caught their three-minute team, Sydenham Wheelers, who were soon down to three men after Rhys Jones came to a halt with a pulled muscle after hitting a manhole cover. The surviving Sydenham trio of Richard Hallett, Luke Evans and Andy Kay nevertheless posted a 109-36 which put them second to Ambrosia until Team Brite `B' came through in 1-05-55. Team Clean were down to three, Stevens having been left behind when what turned out to be a slow puncture saw him drifting off the back through the corners and not getting his second wind. Yates, Prebble and Akam were one second off Ambrosia with their 1-03-55 but reports were already coming through that the Team Brite `A' squad was going "like the clappers." And they certainly were. The silky-smooth formation of Clay, Hayles, Illingworth and Newton were out to make a stand from the start, and a terrific 1-00-33 50kilometre lap put them firmly in command. It left both Ambrosia and Team Clean with well nigh impossible tasks, with deficits of 3-21 and 3-22 respectively. Team Ambrosia were first of the medal contenders home, a 1-03-55 second half just one second slower than the first leg, giving them 2-07-49. The Sydenham trio were next in, their 2-20-.52 worth an eventual seventh place. The Team Brite `B' line-up rode in; Sturgess, Tanner, Walker and Steel had a better second half, 1-0434, which was 1-21 faster than their puncture-ravaged first lap. The Army TTT edged out the Cannons Professional CT with 219-04, but they in turn had been caught by Team Clean, for whom Yates and Prebble had worked hard to keep Akam with them after he had been hit with cramp after dismounting for a wheel change. Yates's team had taken 2-02 longer for the final 50 kilometres (1-05-57), running out with that final 2-09-52. Yates and company -had been caught as well, by Team Brite `A', who had closed the six-minute gap between them. While Yates and Prebble did their best, they had no chance against the Brite four in the long headwind slog down the A148. With eight kilometres left, Illingworth punctured, leaving Clay, Hayles and Newton to ride on to victory and yet another title for the Brite sparks. The Cannons Professional CT line-up of Rowan Horner, Andy Naylor, Andy Lyons and Brian Fleming posted 2-20-20 for a temporary third place. "I don't want to do another of those," was Naylor's immediate comment. For Chris Newton, Team Brite's victory added to the gold medal he collected as a member of the winning North Wirral Velo squad a year ago, and team captain Jonny Clay praised the Middlesbrough rider's contribution. "That was a lot less painful than expected," said Clay as he and his Brite team-mates waited to collect their medals. "Everybody rode well, and Chris did some really hard turns at the front over the last miles." After that 1-00-33 first 50 kilometres, did he think a sub two-hour ride was possible? "It might have been, but we knew we were miles up after that first lap, so we perhaps didn't go as fast as we could have done," Clay explained. "On top of that the wind had got up, as you can see from the second-lap times. "Everyone did their bit and we got the gold, that's what mattered. Matt [Illingworth] was unlucky to puncture towards the end, and we couldn't wait for him at that point." Matt Illingworth accepted his fate. "There were about five miles to go when I punctured, and I didn't get back on: "We had decided before the start that anyone in trouble in the last 10 miles wouldn't be waited for." It could all have been so different. Clay revealed: "We were lucky today. We did have two other punctures, but that was as we were riding to the start!" Ambrosia's Kevin Dawson, who like team-mate Mark Lovatt was a member of the winning Optimum Performance team in 1994 and 1995, was not so lucky. "I had two punctures, and Gilkes and Notley had one each, so we kept our manager Paul Curran busy giving us wheels. "Mark was the only one not to have trouble. He was sensible, and rode on heavy road tyres! It was a good course with no dud bits, and fast: We had a little rain, but it was warm and didn't slow us." The Ambrosia squad had experience on their side. Apart from the gold medals won by Dawson and Lovatt, manager Curran was a winner with Manchester Wheelers in 1985 as well as being a member of England's successful Commonwealth Games squad in Edinburgh the following year. Finding himself in third place for a second successive year, Sean Yates's ride hadn't gone to plan: "The idea was for Tim [Stevens] and David [Akam] to ride within themselves, while Richard and I did the hard work so that we would be four-strong for the head wind bit," Yates explained. "We went over the course on Saturday, and I could see we would need to be at full strength on that section if we hoped to get in the medals. Tim was going too hard at the start, and going into the red. You can't afford to do that in a team time trial. I thought he would pay, even without his puncture, and in the end he was dropped "Then Dave cramped up after stopping with a puncture! I didn't know that at the time - I thought he was getting a slow wheel change," Yates added as team manager Vic Haines interjected: "You should have heard what he was shouting!" As Yates was saying before he was, interrupted: "Then, of course, it became a virtual two-up with me and Richard. Dave did well to stay there, but he's an old professional and knows what's needed. We gave it a lot of stick and managed to get the bronze. All credit to Dave, there was a lot of pressure on him. "Team Brite were in a class of their own. If it had been the usual drag strip course, I'm sure they would have been inside two hours." Like Newton, Dawson and Lovatt, Tim Stevens is a former gold medallist, but his pedigree goes back even further- he was a member of the winning '34 Nomads team back in 1987.